The topic revolved around the etymology of Romania. First, i am bothered by this use of the name "Wallachia". In english it wouldn't have been as complicated as the various names used for this "Wallachia" as it in in romanian. To give some background information, "Wallachia" is used interchangeably with "Muntenia" and "Romanian land" in romanian historiography. Muntenia being exclusively a name moldovans used for Wallachia, the later, the name the natives used. The interesting thing however, is that in romanian history books, prior to 1859 the land is called the way it's natives called it "Romanian Land" (Țara Românească), and as a rule of general knowledge, Wallachia was the international foreign name to designate this country, the natives never used it to call it themselves that way, but exactly in 1859 it is called the union of "Wallachia" and Moldova. Suddenly the perspective of history is switched from that of names used by the natives, to the names used by foreigners. I don't know why romanian historiographers did that, but for the moment let's move on. Doesn't make any sense does it? The historical narrative is that Wallachia united with Moldavia to create Romania, and yet here we see the politicians themselves, recognizing the fact that not only Romania already existed, but they wish to unite with it, not creating a state from a common, joint union, but by letting itself get absorbed. As i said earlier, Wallachia was the foreign name for the country, so romanian historians usually will simply switch from the name Wallachia and say "Well it was a union of Romanian land and Moldavia then". But no mention of either "Wallachia" or "Romanian land" or even "Muntenia", since it was the traditional name for that country exclusively used by moldovans, in the official document that was deciding the matters of the union. Conventionally, it could have went something along the lines of "The x provinces of y and z unite to form the national state of q". Which yet again seems to give a historical hint on the fact that the modern name and delimitation of all of the romanian's homeland was already defined, years infact, prior to the union that allegedly gave birth to the modern state "Romania". Even if we try to dismiss this and try to claim that he was reffering to the state of the serfs (Rumân used to reffer to serf between the 16th and 18th century in Wallachia), why did he specificly use the greeks as an ethnic group and then equate their state, to the ethnic state of the rumanians/romanians? Romanians of this forum, do you know of any earlier historical documents, by native people to Romanian land, that use "Romania/Rumania" as a way to define their homeland? Please be so kind to post them if you do, because the implications this has to the current mainstream narrative of romanian historiography are huge. In any case, it's probably just the shortened form of ''Tara Romaneasca'' (Wallachia); The text is bad from a technical point of view, doesn't particularly mean much. As for earlier mentions of Romania, this was a dream of romanians for quite some time so it's no surprise to hear about it since then 1812 or even earlier. Well, the earliest reference to the word 'Romania' that I know of is that the Pope referred to the Imperator Romanorum (Emperor of the Romans) in Constantinople with the intended insult of Imperator Romaniae (Emperor of Romania, using the genitive singular of Romania) after the coronation of Charlemagne. So there seems to be some reference to the Roman Empire as Romania in the west around this time. But how this name may have come to be applied to the people north of the Danube, I do not know, as the Empire's Borders generally stopped at the Danube; there was a short time when that part of Dacia was under Roman rule, but that ended around 300 AD and I'm pretty certain the name doesn't date from then. Perhaps it was a term used to describe the region by the Austrians or the Hungarians originating in the 15th or 16th centuries with reference to the then fallen Empire? I'm not certain, I don't really know enough about the history of that region to comment. I've always been a bit curious about how Romania got its name as well, perhaps someone more knowledgeable of Romanian history has more to add than I do. Bellow i posted a scan on imgur. The moldovan unionists could have very well used the traditional name it used for Wallachia before, Muntenia, or even the conventional international name "Wallachia" but instead they used the name the natives had in mind at the time. Keep in mind, the unionists of both sides in Wallachia and Moldova adopted the same identical texts for their proclamations. Meaning, Romania in it's modern form existed long before the union of 1859, meaning romanians clearly had in mind the fact that they were romanians living in romania already, and this "national awakening" is more likely something present day historians invented to give the event more romance and bigger patriotic spirit. You even emanate this feeling in your own post[bolded line], suggesting this is the feeling and thinking most romanians are taught to have in schools. This was in the context of the 1821 revolution. Vladimirescu specificly used the name Ruminia to designate the territory of Wallachia. I don't see how he could have had in mind Moldova when he was fighting for his own country. And there was barely a nationalist sentiment in Moldova at that time. The 1848 revolutions had were years ahead for such concepts to even appear in Moldova. The term romanian (român in romanian) comes from ''roman''. The massive colonization and the assimilation policy carried out in Dacia resulted in a population identifying itself as roman. -CONSTANTINE FLAVIUS PORPHYROGENITUS (BYZANTINE EMPEROR 913-959): These vlachs (term used by germanics and slavs to refer to romanians and italians) are settlers from italy. -POPE CLEMENT VI (1342-1352): In Hungary,Transilvania,Muntenia and Sirmia live the Roman-Vlachs. - Despot Voda (1561): We are a brave people of a warrior race, descendants of the illustrious Romans, who made the world tremor. And in this way we will make it known to the whole world that we are true Romans and their descendants, and our name will never die and we will make proud the memories of our parents. - The great savant Miron Costin(17th century): We romanians come from italy. - Francesco della Valle (1532): Romanians call themselves romans in their own language. I could give 200 more quotes but you get the idea. The hungarians (later austrians) held dominance over what is today 1/3 of Romania and in no way influenced us to such a level as to actually give us our name. Romanians have always fought for survival vs slavs, hungarians, turks, mongols, etc. All tried to kill us, colonize us, persecuted us romanians living under their rule, etc. We always wanted to be under one state of ours, that represents our interests and creed. Well the answear to that question would be easy, since the romanian ethnogenesis happened both north and south of the danube. The name "Român" itself from latin "Romanus" translates as "Citizen of Rome". It can only be concluded that those former dacians kept cultural, economical and social contact with the eastern half of the Roman Empire and then the ones who settled future Wallachia, just used a name for the country as an extension of how they called themselves, even if, technically, they weren't part of the borders of the empire anymore. The lineage Rome left in former Dacia must've been very strong that it left such a strong and deeply rooted self-identification process of the local population. The moldovan unionists could have very well used the traditional name it used for Wallachia before, Muntenia, or even the conventional international name "Wallachia" but instead they used the name the natives had in mind at the time. There was no ''Wallachia'' this was a term used by foreigners, we used the term ''Tara Romaneasca''. Another possibly is that Romania was first founded legally right before the union which moldova which was clearly coming. This is purely a technicality and has no meaning. Keep in mind, the unionists of both sides in Wallachia and Moldova adopted the same identical texts for their proclamations. Meaning, Romania in it's modern form existed long before the union of 1859, meaning romanians clearly had in mind the fact that they were romanians living in romania already, and this "national awakening" is more likely something present day historians invented to give the event more romance and bigger patriotic spirit. This makes no sense, this isn't an event that just fell from the sky, this is a long campaign of almost 400 years at that time, it's not something that just fell in our arms for us to pump it full of air. The very fact you're looking at the act of foundation is proof you're wrong. If you really want to see this as a fabrication of our history and you clearly want to, then feel free to do so, no amount of argumentation will persuade you I'm sure of that (first thing being that you want to build such an elaborate story on a supposition). Presuming you are right... I don't see how this affects anything in the direction you want to point out ? Romanians had been living in Tara Romaneasca, Tara Romaneasca a Moldovei, Ardeal, etc since forever and they've always identified as romanians and all worked hard for hundreds of years to achieve a state of their own, if this doesn't prove their national identity idk what does. You even emanate this feeling in your own post[bolded line], suggesting this is the feeling and thinking most romanians are taught to have in schools. I didn't bold anything and I never paid any attention to the history classes at school. This is a huge image painted by hundreds of years by major and constant events. Again if you want to see a conspiracy, and you most clearly want to see a conspiracy, fine. Presuming what you said is correct. He was fighting for romanians all over and for the country project. The thing about lack of nationalism in moldova is just and contradicted by the historical events themselves. What do you think about what Miron Costin wrote in De neamul moldovenilor? [...] măcară că ne răspundem acum moldoveni; iară nu întrebăm: ştii moldoveneşte? Ce: ştii româneşte? Where ? I don't see anything. Why would it do that since the official narrative, and the one that you also seem to be pushing, was that the union was a joint thing created by both principalities? A national state for all romanians to live in. Do you have any other parallels in history to assert the hypothesis that a country's name changed right before a national union? What campaign? As far as i know, the nationalist sentiment started to appear with the 1848 revolutions, as well as all over europe, since the concepts of nations and nationalism started to appear, generally, in the 19th century. 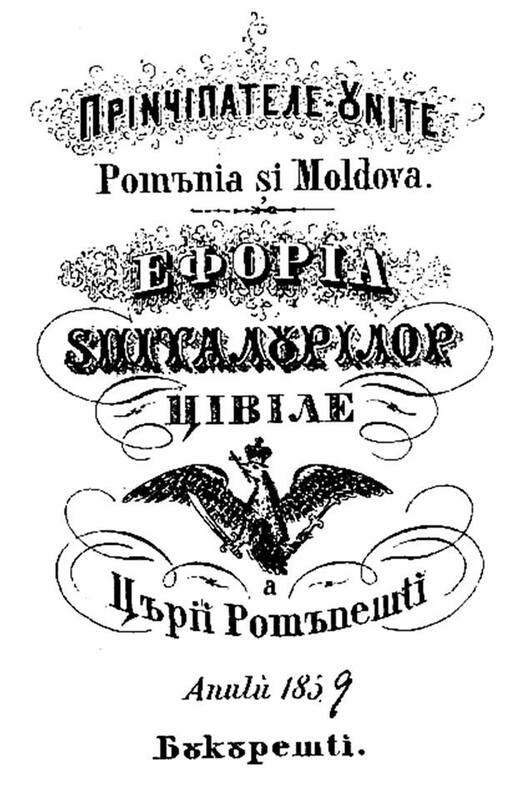 That's the constitution of 1866, when the principalities of Romania and Moldova simply became Romania. As you can see, both principalities still stuck to their original names under a loose confederate state, even after the union. Romania (Wallachia) and Moldova. The constitution of 1866 abolished this loose confederate status and simply extended the entire name over Moldova. And thus the Romanian state had one government with 1 king. No need to be so defensive. What im asking is for genuine historical discussions. The notions of nation and nationalism, as well as national identity are things that were concepts invented in the 19th century. It's silly, even for history enthusiasts, to assume and project the modern notions of nations applied to medieval times as well. Not to mention that there isn't at least 1 instance of a modern attempts to create a romanian state before 1859. I highly doubt that. Nowhere in his declarations or even his actions did he mention a country project beyond the borders of Wallachia. Unless you can post some veritable sources to point this out.